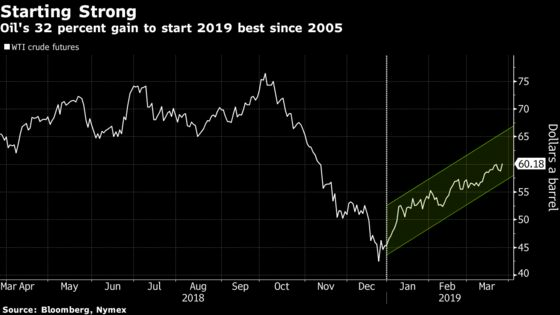 (Bloomberg) -- Oil continued its torrid start to the year as bullish supply news from the world’s second-biggest producer and disruptions to refiners along the Houston Ship Channel kept futures on pace for the best first quarter since 2002. Crude rose 1.9 percent in New York on Tuesday. Energy Minister Alexander Novak told reporters in Moscow that Russia will likely reach its pledged output cut of 228,000 barrels a day by the end of the month. OPEC and its partners, led by Saudi Arabia, have been cutting supplies to counter a global supply glut. In the U.S., the industry-funded American Petroleum Institute was said to report crude stockpiles rose 1.93 million barrels last week. Meanwhile, a four-day closing of the Houston Ship Channel following a tank fire and subsequent chemical spill has further disrupted supply networks. Crude futures have rallied 32 percent this year as OPEC and its allies implement production cuts to stave off a global surplus. American sanctions on Iran and Venezuela have further squeezed supplies, making for a tighter market more susceptible to disruptions like those in Houston. “The expectation is very much that OPEC+ will stick to its 1.2 million barrel a day reduction plan for as long as one would expect for that market to come into balance,” said Bart Melek, head of global commodity strategy at TD Securities in Toronto. West Texas Intermediate for May delivery traded at $59.97 a barrel at 4:45 p.m. after settling at $59.94 on the New York Mercantile Exchange. Brent for May settlement advanced 76 cents to $67.97 a barrel at settlement on the London-based ICE Futures Europe exchange. The global benchmark crude was at a premium of $8.03 to WTI. Meanwhile, the U.S. administration is deeply divided as a deadline approaches for a decision on whether to exempt some countries from sanctions on Iranian crude. The division -- primarily between John Bolton’s National Security Council and Michael Pompeo’s State Department -- has led to rising frustration and flared tempers. Above the fray, at least for now, is President Donald Trump, who must weigh competing priorities. While Trump wants to make good on his “maximum pressure” campaign against Iran and strong-arm the country into meeting U.S. demands, there’s also concern that squeezing Tehran too much will lead to a spike in oil prices that could raise gasoline costs for U.S. drivers as the 2020 election approaches. In the U.S., analysts in a Bloomberg survey were expecting a 2.5 million barrel draw in domestic crude stockpiles. The API was also said to report that supplies in Cushing, Oklahoma, rose 688,000 barrels, while gasoline inventories declined 3.47 million and distillate stockpiles slid 4.28 million. The Energy Information Administration will release its weekly tally on Wednesday. The OPEC+ committee that oversees the deal will meet in Jeddah on May 19, according to delegates. A giant crude oil pipeline in the prolific Permian Basin appears dead in its current form, with one of the partners telling investors it’s not likely to happen and another removing references to the project in company documents.